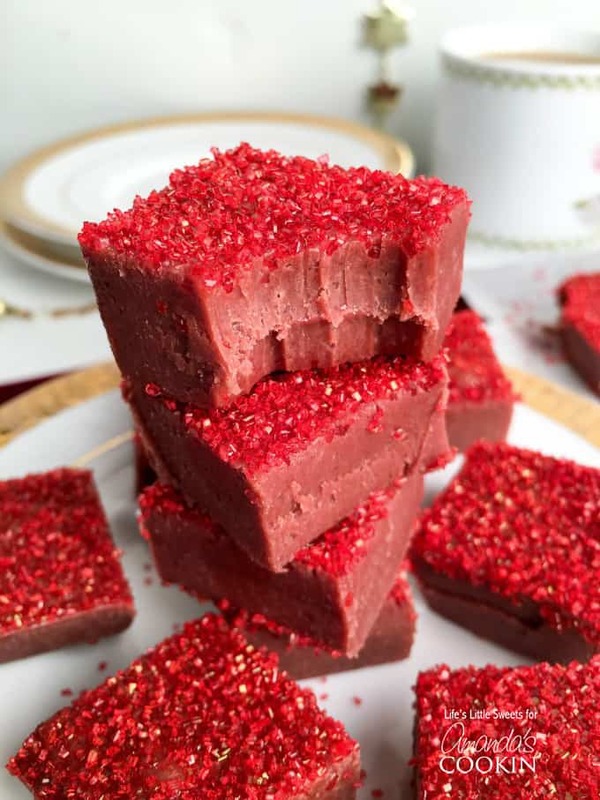 This Red Velvet Fudge is so smooth, chocolate-y and the perfect indulgence to enjoy yourself or give as a gift to someone special. This recipe uses mini marshmallows making it an easy-to-make, quick fudge recipe. Red. Velvet. Fudge. 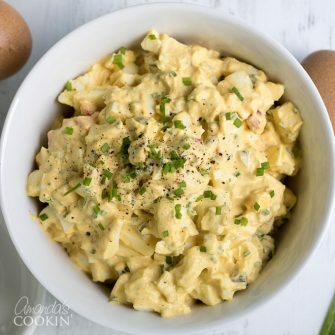 It’s the stuff that my dreams were made of until I finally decided to come up with a recipe to make those dreams a reality. 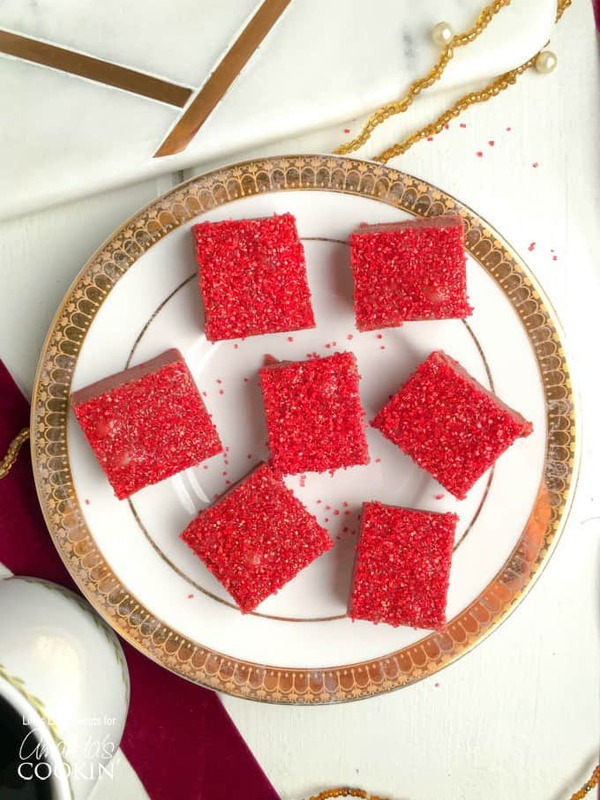 My Mother-in-Law loves red velvet-anything and so this recipe is partly inspired by her love for red velvet foods and also my Chocolate Walnut Fudge recipe. 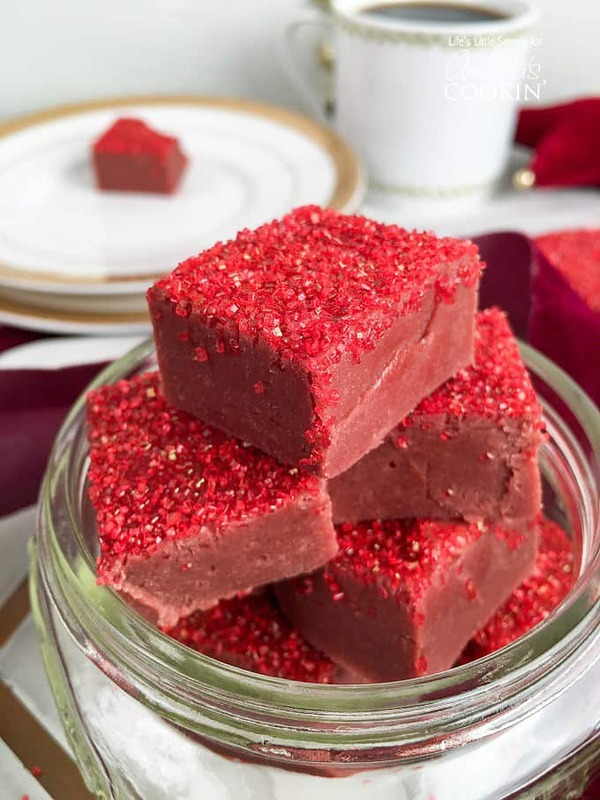 This Red Velvet Fudge recipe is so smooth because it has mini marshmallows, butter and white chocolate. It has full, rich flavor due to the butter and the combination of white chocolate, vanilla and cocoa powder. Yes, the combination of white chocolate and cocoa powder is a deliberate combination on my part. Could you get a brighter red without the cocoa powder, sure but you would be missing out on that rich, chocolate flavor. Imagine getting a box of these for Christmas, Valentine’s Day or any special occasion? Don’t forget the red velvet ribbon! 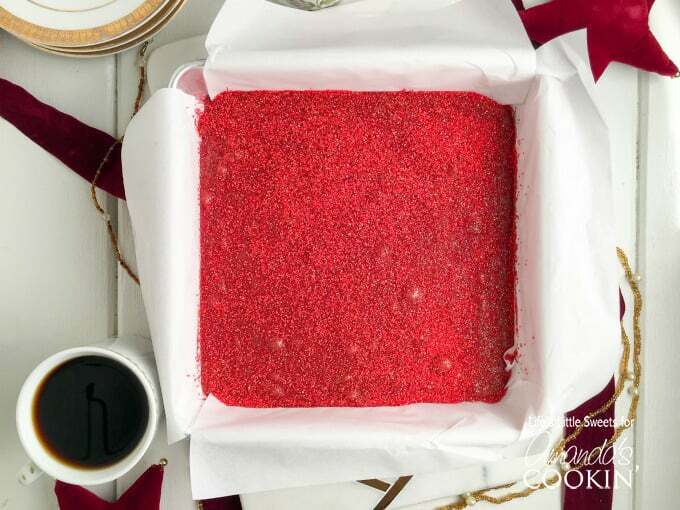 Not including cooling time, start to finish, this Red Velvet Fudge recipe only takes 20 minutes! 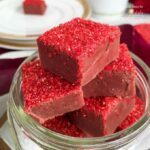 You are going to love this Red Velvet Fudge recipe, it’s so good, just take a bite! Using a medium or large saucepan over low-medium heat, add 4 tablespoons of butter, 3 cups mini marshmallows, 1 cup sugar, 1/2 cup heavy cream, 1/4 cup cocoa powder and 1/2 teaspoon kosher salt. Stir gently until the mini marshmallows are melted, this may take 8-10 minutes. 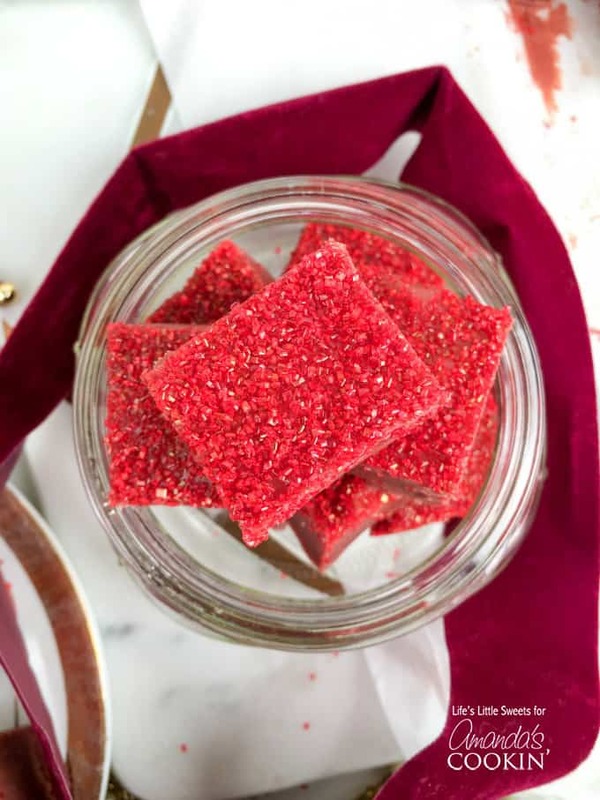 Remove from heat, add 1/2 teaspoon vanilla, 12 ounces of white chocolate chip morsels and desired amount of red gel food dye (about 38 drops), stir until the chocolate is fully melted and everything is combined. Pour into prepared 8" x 8" pan. Allow to cool for 30 minutes. Sprinkle 1 tablespoon or more of red sugar sprinkles over the top 15 minutes into cooling. Cover and transfer to refrigerator and set for 1 hour. When the fudge is completely set, use the overhang of the parchment paper to gently lift the fudge onto a cutting board to cut for serving. Package in jars or boxes if you are gift giving and don't forget the red velvet ribbon! Enjoy! 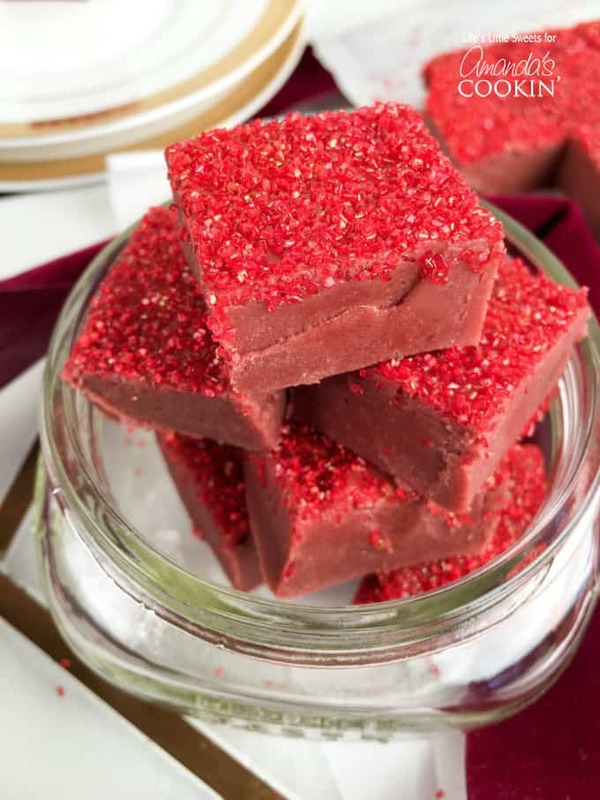 You can store this Red Velvet Fudge in the refrigerator in an air tight container for up to 5 days.